Unlocking The Book of Proverbs - (EPT) Excellence Private Training Sign up online today! PaSTOR D sign up today for private training (In-Home). We provide piano, guitar, bass, keyboard sequencing, voice, song writing lessons. Also audio & video production graphic design, website designing and ministry preparation & bible training. 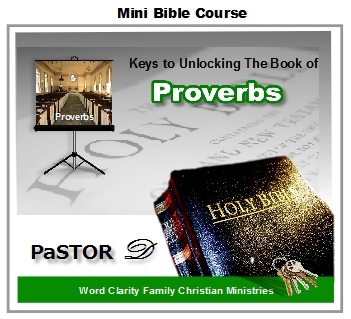 The Book of Proverbs is filled with divine & practical wisdom and knowledge. Yet, most people have not grasped the wealth of knowledge embedded in them. This course will invite a deeper love and understanding for the Book of Proverbs. You do not have to be a Bible scholar to tap into the wisdom of Proverbs. King Solomon, famous for his wisdom, is credited as one of the authors of Proverbs. Other contributors include a group of men called "The Wise," Agur, and King Lemuel. Proverbs was probably written during the reign of Solomon, 971-931 B.C. Proverbs has several audiences. It is addressed to parents for instruction to their children. The book also applies to young men and women who are seeking wisdom, and finally, it supplies practical advice for today's Bible readers who want to live a godly life. Although Proverbs was written in Israel thousands of years ago, its wisdom is applicable to any culture at any time. On the Left: 4 Page Document. Click Arrow Buttons to switch through pages.